I realized I haven't baked any new desserts in a while, certainly not since starting Weight Watchers. However, I want a life of balance. Yesterday, I was craving a cookie after my fabulous six-mile run. And I would not be satisfied with an orange. These cookies were an invention out of what I had on hand. I had some unsweetened, reduced fat coconut shreds, coconut oil and white chocolate chips. 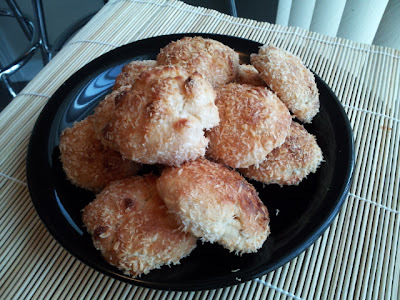 I decided to roll the cookies in extra coconut to really take them over the top, too. The end product reminds me a bit of a sugar cookie. There's a nice crisp on the outside and a chewy, almost creamy interior. What's interesting about these cookies is that there isn't a ton of sugar in it, and coconut oil is one of the saturated fats that's supposed to be good for you. In other words, these cookies are sort of healthy. Not as healthy as an orange, but hey, you have to live a little. The points plus value of these are roughly 5, but Weight Watchers doesn't have a point value for reduced fat unsweetened coconut, so they could be less. Start by mixing the flour, coconut, baking powder and salt together. Set aside. Using the flat paddle attachment on your stand mixer, cream together the coconut oil and eggs, then add the sugar and vanilla. Slowly add the dry ingredients in thirds, then add the chocolate chips. Chill the batter in the fridge for a half hour while the oven preheats to 350 degrees. I prepared a baking sheet by lining it with my silicone mat, but a nonstick cookie sheet would work just as well. Fill a small bowl with more coconut. 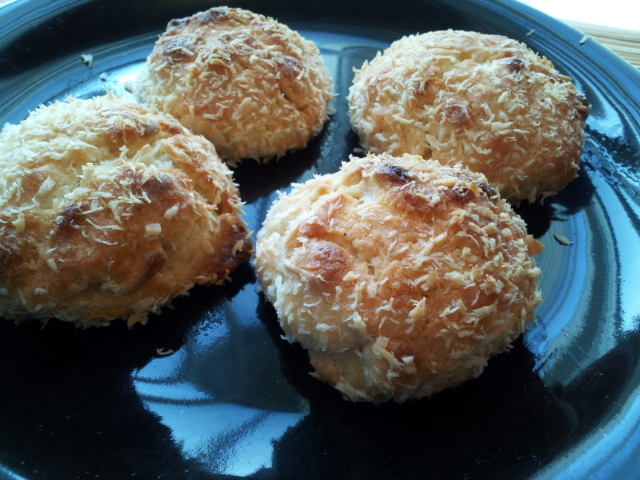 Roll the batter into 1 Tablespoon balls, then roll in the coconut and place 12 per baking sheet. Bake for 13 minutes. I placed mine under the broiler for one minute to get a bit of extra browning, but that's optional. This recipe makes 24 cookies. I froze half of the cookie balls for another day. These look delicious!! I'm tempted to try them soon. Any idea on the PP value? I calculated them to be roughly 5 PP per cookie. However, WW didn't have a value for unsweetened, reduced fat coconut, so it very well could be less if you're using the same stuff I did.